The U.S. Consumer Product Safety Commission (CPSC), in cooperation with Playkids U.S.A. of Brooklyn, N.Y. is announcing today a voluntary recall of about 2,000 convertible cribs because the sides of the convertible crib are made of a mesh that expands, creating a gap between the mattress and the side through which an infant can slip. This poses suffocation and entrapment hazards for young children. CPSC is aware of the death of a 5-month-old child on August 31, 2008 in Brooklyn, N.Y. The child became entrapped between the mattress and the drop side rail of the convertible crib and suffocated. This recall involves the Playkids U.S.A. convertible crib/playpen/bassinet/bed with model number PLK-909. “Playkids U.S.A.” can be found on the packaging and on a label sewn into the side of the crib. The model number can be found on the packaging. The convertible cribs have a drop side rail, a stationary side rail, a canopy assembly, and a bassinet. 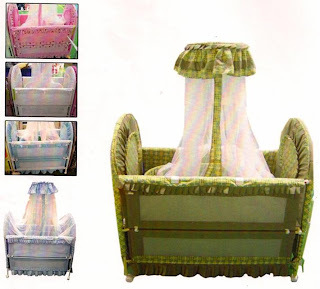 The sides of the convertible crib, the mattress support, the bassinet, the canopy and the bedskirt are covered in fabric and mesh. The fabric and the mesh come in a variety of colors and patterns. Consumers should stop using the recalled convertible cribs immediately and contact Playkids USA collect at (718) 797-0302 (9 – 5, M – F) to receive a full refund. PlayKids USA manufactures unsafe baby products. If anyone comes across their products or receives one as a gift as I have, do not use it for your child. They supply these products to stores primarily in low income neighborhoods. They run and hide when a recall of their products is issued. I have been contacting this company for over three months in order to receive a refund for their convertible crib that was recalled after the death of a five month old infant in Brooklyn. I would like to know if anyone else is having the same issue.